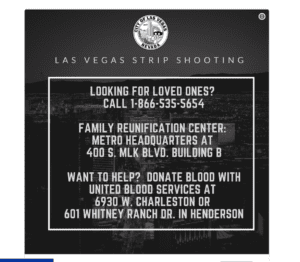 If you’re at a lost for how to help, here’s a start from a trusty source: An online campaign to raise funds to help the victims of the deadly Las Vegas shooting has already raised more than $2 million in the first 12 hours. The GoFundMe campaign, created by Steve Sisolak, the Clark County Commission Chair from Las Vegas, is already closing in on its goal of raising $2.5 million. Last I looked, people donated some $2,150, 758 – most in the form of $10 and $20 increments. “I’m overwhelmed by the outpouring of support from the Las Vegas community & beyond. We need more donations, every penny will be put to use,” Sisolak wrote in a tweet. Sisolak, who said he started the fund with Clark County Sheriff Joseph Lombardo, said in a tweet he had pledged the first $10,000. 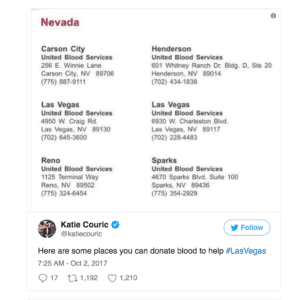 The fund will be used to provide relief and financial support to the victims and families of Sunday night’s shooting, which has so far, claimed the lives of 59 people and injured some 527 more, when a gunman perched on the 32nd floor of a Las Vegas Strip casino started firing on concert-goers at an outdoor country music festival below. You can also support the National Compassion Fund, which directly distributes donations from the public to victims of a mass crime. The fund has previously partnered up with the relatives of victims of disasters like 9/11 and the 2012 Sandy Hook Elementary School shooting and vows to be transparent in how it handles the money it collects. After you’ve written a check, make your voice heard politically, as well. Call your representative and talk to him or her about gun laws both in your state and nationwide. The House of Representatives’ switchboard number is (202) 224-3121. Nationally, the House of Representatives is weighing legislation that would ease up on rules concerning gun silencers, which law enforcement officers argue could make it harder to identify the suspect during mass shootings. If you want to change that, find the phone number for your representatives and senators here and let them know what you think. Your actions may ultimately do more to help victims of future attacks than lawmakers’ tweeted thoughts and prayers. are too lax, get in touch with groups like Everytown for Gun Safety and the Brady Campaign to Prevent Gun Violence. Sunday’s shooting is considered the deadliest mass shooting in modern US history.